A beautiful Lake Forest pool home! Over 2100 sqft, remodeled, cul de sac location, member of Beach and Tennis Club. 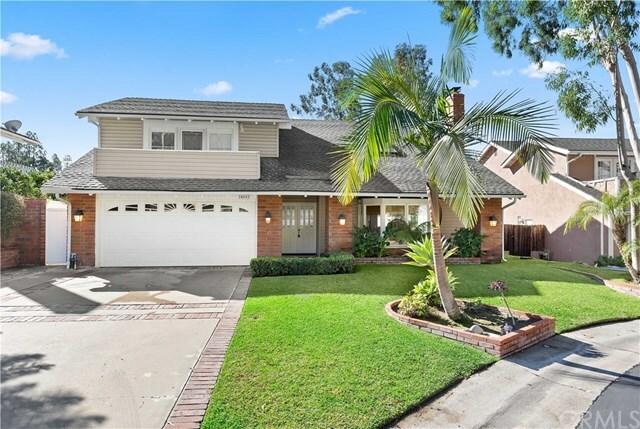 This home boasts over 2100 sqft of living space, 4 bedrooms, 2.5 baths of remodeled beauty! Enter the double door entry to soaring ceilings with skylight. Large open floorplan with formal living room with cozy fireplace, formal dining room w modern lighting. Spacious family room and kitchen w plenty of windows for natural light. Completely remodeled kitchen with custom cabinets and beautiful stone counters w glass backsplash. Quality stainless appliances: Wolf stove, Viking microwave, Samsung refrigerator and Maytag dishwasher. Farmhouse sink, stainless faucet, LED lights and Eat-at breakfast bar. Remodeled powder room with pedestal sink, and custom lighting. Huge master bedroom with volume ceiling, French doors & balcony. Master bath with custom stone work and stainless fixtures. Walk-in master closet with organizers. Remodeled secondary bathroom with custom counters, flooring, lighting & tub surround. All secondary bedrooms have mirrored wardrobe doors, 2 w sliding glass doors to balcony, one w built in desk and shelves. An entertainer’s back yard w sparkling pool and spa, pavers decking, grassy area, block wall, vinyl fencing. Vinyl windows throughout. Inside laundry. 2 refrigerators, washer and dryer included! Oversized 2 car garage with overhead storage and cabinets. Close to schools, Beach and Tennis Club, entertainment and freeways!